Quinoa has been considered a superfood for many years now. 2013 was even declared “International Year of Quinoa“ by The United Nations General Assembly because they believe Quinoa can play an important role in eradicating hunger, malnutrition and poverty due to its nutritional content. However, there has been a lot of contention surrounding so-called superfoods. Many are sceptical about whether foods labelled as “super” actually provide the health benefits they claim. Some peace of mind can be found in the fact that in 2007, the EU introduced a legislation banning the use of the term superfood, unless accompanied by scientific evidence. The following 5 reasons to love quinoa show that whether or not it is officially considered a superfood, there are still benefits to including it in your diet. Quinoa is also the only grain that is considered a complete protein because it contains all eight of the essential amino acids. This makes quinoa an excellent source of protein for anyone following a plant-based diet. Additionally, quinoa is high in important minerals such as magnesium, iron, potassium and zinc. It is also believed to be high in antioxidants. With wheat and gluten intolerance increasing, many people are being forced to cut out favourites such as bread and pasta. As quinoa is gluten free, it can be enjoyed by those with wheat and gluten intolerances. Quinoa can also feel lighter than wheat products and is less likely to leave you feeling heavy and bloated. Quinoa cooks in less than 15 minutes and at its most basic only requires you to add water. It’s made in a similar way to rice – rinse, add to a pot with water, bring to the boil, cover and leave it to cook. The instructions that come with quinoa recommend 1 cup of quinoa to 1 1/2-2 cups of water. For me, this results in more of a porridge texture, which is not always desirable. I use 1 cup of quinoa to 1 1/4 cup of water. As mentioned above, at its most basic, quinoa only requires water. However, this can result in extremely bland tasting quinoa. Quinoa can be eaten as part of a savoury dish such as Stir Fried Quinoa with Shrimp and Vegetables; as an entrée or starter such as these Quinoa Stuffed Peppers or as a sweet Quinoa Pudding dish. You can enjoy quinoa for breakfat, lunch and dinner and it is also used to make delicious snacks. Quinoa also comes in different forms. It can be puffed, rolled into flakes or ground into flour. The most common form is whole quinoa, which comes in white, red and black varieties. White quinoa is the most common and widely available. White quinoa is available in most supermarkets. The price can vary, so it’s good to shop around for the best price. Many health food shops stock all three varieties as well as quinoa puffs, flakes and flour. Although quinoa is gluten-free, some people still experience difficulties digesting it. Quinoa, like most other grains and cereals, contains phytic acid. Phytic acid can block the absorption of nutrients, disrupt healthy gut bacteria and cause poor digestion. 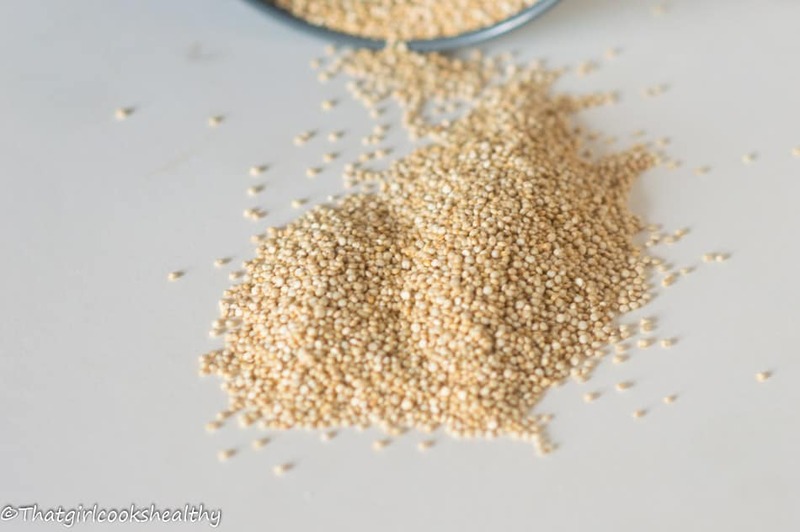 Rinsing and soaking quinoa before cooking can reduce the effects of phytic acid. And sprouting is considered to be an even better option. You can easily sprout quinoa at home and there are lots of resources available online telling you how to do so. Sprouting changes the structure of quinoa so it depends on how you intend on using it. If you are looking for something to replace rice in a meal for example, then rinse, soak and cook as normal. However, if you’re making a salad, stir fry or vegetable dish, consider using sprouted quinoa – in a similar way to beansprouts. As you can see, quinoa is an extremely versatile and nutritious food that can be easily integrated as part of a healthy diet. Whether you eat anything and everything, have a gluten or wheat intolerance or follow a vegan or vegetarian diet, you can still have quinoa for breakfast, lunch or dinner. NB: However you choose to enjoy your quinoa, always remember to rinse quinoa before cooking, if using in its whole grain form. Bio: Leanne Lindsey is a freelance writer and blogger for hire specialising in wellbeing, lifestyle and self-improvement topics. She is also a life coach who loves inspiring and motivating women to live happy, healthy lives they love. Visit her website to learn more about her available blogging services and to grab her free guide on how to live a happier life.